A good first Film followed by an even better sequel. That's how I would have described the Shrek series if they had stopped there. But they didn't. They made Shrek the Third, a forgettable film, to say the least. 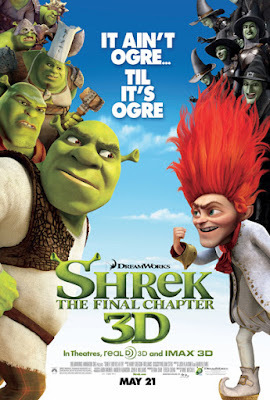 That wasn't enough and they made a fourth movie, Shrek Forever After, another terrible addition to the series. There's a bright side though, with this one they finally stopped wearing down Shrek. Since they were out of ideas, Shrek (Mike Myers) has some sort of mid-life crisis. He is drowning in his domestic routine life, all he wants is to be a real ogre again and makes a deal with Rumpelstiltskin (Walt Dohrn) to go back to his life before rescuing Fiona (Cameron Diaz). As he is erased from existence, Shrek finds himself in a dark alternate timeline where Rumpelstiltskin is king, ogres are hunted, and he and Fiona have never met so he sets out to restore his world. I'm going as far as saying that I found the storyline to be quite interesting. Unfortunately, it was poorly executed and the result was what would probably happen if It's a Wonderful Life had a baby with a fantasy film, a very ugly baby. There are some twists but the overall plot is so boring, it makes for a very unpleasant watch. What really bothered me about this is the huge plot hole caused by Shrek 2. If Shrek didn't exist and therefore never rescued Fiona, Prince Charming would have saved her from the dragon and the alternate timeline of this film would have never existed. 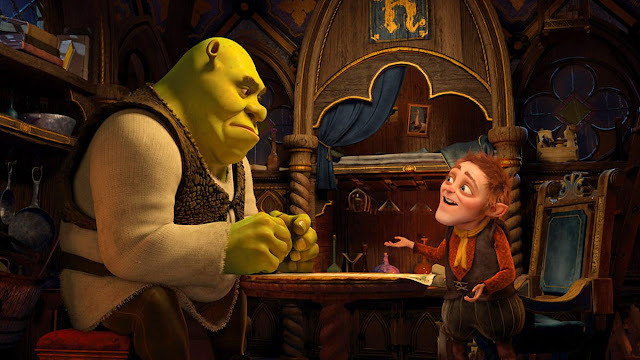 Anyway, the major problem with Shrek Forever After is that, order than completely lacking the charms and magic of the first two films, has no comedy whatsoever. The humour is gone, there are no one-liners for Donkey, and the characters only come off as annoying. And it looks like the writers didn't care much about the characters either. There's no development and no reason to empathize with them or care for them. Also, the villain is weak as never before. What really pisses me off is that the filmmakers knew it would be a mess so they added, here and there, some scenes that have absolutely no purpose in the story, like that dreadful dance number with the ogres and the very long scene where Shrek flies a witch's broom to escape from Rumpelstiltskin's castle. This last one was well done and kinda cool, still it had no reason to be in the film.